This is probably the most star-studded opener you will ever see. These six don’t need any real introduction but there are some little sub plots here. Nagayo had retired in 2006 but came back for ‘one match only’ for Masami’s final night as she is a very gracious host. Of course we also have the old AJW feud from the 1980s popping back up as Nagayo and Matsumoto are on different teams, and we get other high caliber wrestlers with Hotta, Satomura, and KAORU to round out both teams. It should also be noted that Masami is wrestling this match as “Super Heel Devil Masami” so she is extra evil and has her face painted. 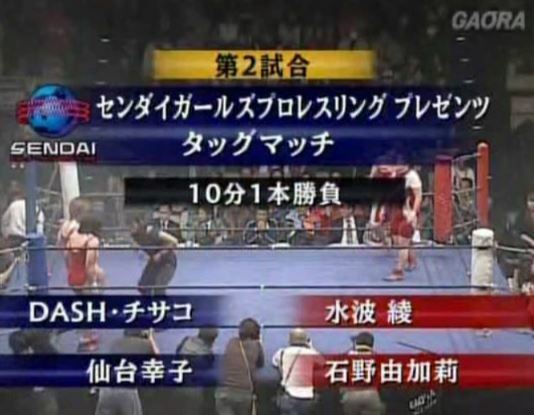 Nagayo and Masami start the match and they trade strikes, Masami shrugs off Nagayo’s strikes but Nagayo hits an armdrag. Masami goes all evil and scares Nagayo into the corner, she tags in Matsumoto who comes in with a kendo stick, which she uses to hit Nagayo repeatedly. Nagayo eventually grabs it and Hotta comes in and smacks Matsumoto in the face. Nagayo tags in Satomura but KAORU runs in and hits Satomura with a piece of table. Hotta returns and they double team Matsumoto, but Matsumoto comes back with a lariat to Satomura and tags in KAORU. KAORU hits Satomura with the table piece but Satomura hits a rebound elbow out of the corner followed by the Pele Kick. Hotta becomes legal somehow and elbows KAORU, Nagayo struts in and kicks KAORU in the head. Tiger Driver by Hotta to KAORU, but the pin is broken up when Matsumoto hits the referee with the kendo stick. Nagayo stays in with KAORU but Masami lariats her from the apron and comes in to hit a leg drop. Moonsault by KAORU, Masami picks up Nagayo but Nagayo uppercuts her, Nagayo goes off the ropes but KAORU hits her with the table piece. 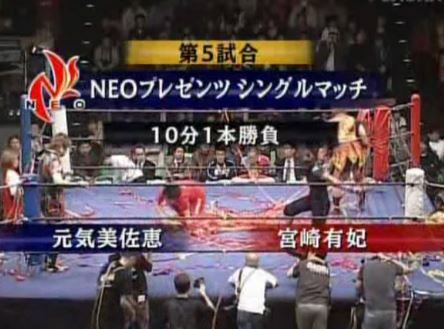 Matsumoto comes in while the crowd squeals, and Matsumoto stabs Nagayo in the head. She keeps stabbing Nagayo until she starts bleeding, Masami covers Nagayo but it gets a two count. Satomura comes in and they take turns kicking Masami, lariat by Nagayo but it gets a two count as Masami does a zombie kick out. Hotta tries to help but it backfires, KAORU comes in to spray mist at Nagayo but she misses and hits Masami by accident. Uppercut by Nagayo but Masami headbutts her, Fire Valley by Masami and she gets the three count! Masami, Matsumoto, and KAORU win! This is a Sendai Girls’ Offer Match. A few of these names should be familar to you, as this is an early match with the Jumonji sisters, before they became one of the top Joshi tag teams in the world. Chisako still wrestles in Sendai Girls’, while Sachiko retired in January. On the other wise, Mizunami is currently one of the top wrestlers in Pro Wrestling WAVE, she left Sendai Girls’ in 2011 to join GAMI’s promotion. And finally, even though the name Yukari Ishino is not familar, you may know her better as Kagetsu, a current title holder in Stardom and part of K4 in OZ Academy. So quite the group of young wrestlers that later would find a lot of success in the Joshi scene. Chisako and Mizunami are the first two in, Chisako grabs Mizunami’s arm and Sachiko comes down off the top turnbuckle onto it. Mizunami puts Sachiko in a headlock and tags in Ishino, dropkicks by Ishino and she covers Sachiko for two. Back up they trade elbows, Sachiko wins the dual and she tags in her sister, who works over Ishino in the corner. Dropkicks by Chisako but Ishino quickly rolls her up for a two count before hitting a series of dropkicks. Ishino tags in Mizunami, scoop slam by Mizunami and she hits quick legdrops for a two count cover. Chisako comes back with dropkicks, Sachiko goes up top and hits a missile dropkick onto Mizunami. Even more dropkicks by Sachiko (lots of dropkicks in this match) and she hits a DDT, but Mizunami gets Sachiko up and hits a shoulder breaker. Mizunami tags in Ishino but Chisako runs in and dropkicks her, double dropkick to Ishino and Sachiko covers her for two. Sachiko jumps up on the second turnbuckle and hit a tornado DDT, Northern Lights Suplex by Sachiko but it gets a two count. Ishino gets Sachiko up on her shoulders and hits a Samoan Drop, she picks her up again but this time Sachiko wiggles away and hits a DDT. Scoop slam by Sachiko, Chisako comes in and Sachiko suplexes Chisako onto Ishino. Somersault senton by Sachiko, but Ishino bridges out of the cover. Sachiko picks up Ishino, Chisako boots Ishino in the head and Sachiko delivers a German suplex hold for the three count! Chisako and Sachiko are the winners. It is interesting that Sendai Girls’ sent their babies for the offer match, but considering the match they had to follow it was probably for the best. Lots of rookie-based offense here, meaning lots of dropkicks and the like, but occasionally they would throw in something different to show they weren’t complete novices. Chisako and Sachiko were already working well together, they teamed for seven more years after this match so you can imagine how much better they got. A fun easy to watch opener-style match. This is a Ito Dojo/IBUKI offer match. Sato was trained by Ito and was a Freelancer, wrestling in a bunch of different promotions including LLPW, Sendai Girls’, and WAVE. She stopped wrestling 2011 and is the only wrestler in this match that is officially out of wrestling. Hanako Kobayashi is better known today as Hanako Nakamori, she was also trained by Kaoru Ito and was unaffiliated. On the other side, Misaki Ohata wrestled for IBUKI back in 2008 but is better known today as one of the stars of Pro Wrestling WAVE, while Ray is currently out of wrestling as she was diagnosed with cancer in February of 2016. Ray and Sato begin the match, hard shoulderblock by Ray and she hits a springboard armdrag. Ray cartwheels away from Sato and both wrestlers go for dropkicks, Ray gets Sato in the ropes and chops her in the chest. Ray tags in Ohata, Ohata goes for a cross armbreaker but Sato gets into the ropes. Dropkick by Sato as Kobayashi comes in, and Ohata is double teamed. Dropkicks by Sato, and she covers Ohata for a two count. Ohata starts her comeback but Sato slips away and tags in Kobayashi, missile dropkick by Kobayashi but Ray kicks her from the apron. Kobayashi is double teamed and covered by Ohata for a two count, armdrag by Ohata and she hits a low crossbody. 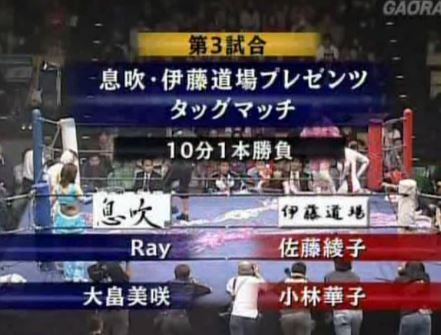 Ray goes up top and hits a cartwheel kick off the ropes, she picks up Kobayashi and hits an enzuigiri. Ray goes up top as does Ohata, but both wrestlers miss moonsaults. Kobayashi hits a diving crossbody on Ray, then Sato follows with a missile dropkick. Kobayashi picks up Ray and hits a fisherman suplex hold, but it gets a two count. Kobayashi goes up top but Ohata hits her before she can jump off, Ray goes up with her but Kobayashi pushes Ray to the mat and hits a diving crossbody. Ray hits a German suplex on Kobayashi, jumping kick by Ray and she nails a moonsault for the three count! Ohata and Ray are the winners. A simple match, nothing bad but utterly forgettable. Ray was a great flyer and got a few chances to show it here, but no one else made much of an impression. With only six minutes they didn’t have much time anyway, mostly just filler. This is a Pro Wrestling WAVE Offer Match. GAMI, Shibutani, and Sora are all retired now, but the rest are still active on the scene. Kana of course is Asuka now in WWE, while Ohka and Haruhi are still in WAVE. 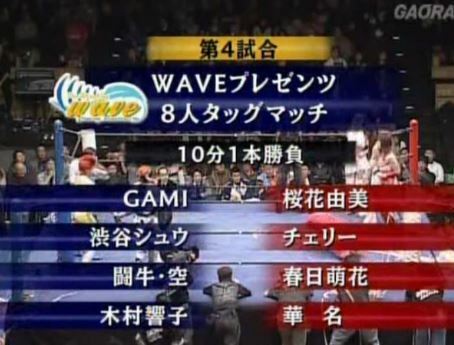 Cherry wrestles in DDT while GAMI is still the founder/promoter of WAVE. This match will have a bit more comedy then the last few and will likely be more chaotic, I’ll keep up the best I can. Sora and Haruhi start off, Cherry comes in too but Sora hits a crossbody on both of them. Kana runs in and starts hip attacking everyone, until Kimura boots her in the head. Ohka comes in to help but so does GAMI, and GAMI hits everyone in the head with a horn. She gets dropkicked, then Team Kana pose on Gama and Sora. Team GAMI end up back in control as they do the triple leg submission hold spot in a circle as they run through the indy wrestling cliche spots until things settle back down with Sora and Haruhi still the legal wrestlers. They tag in Kana and Kimura, they trade elbows until Kimura headbutts Kana to send her to the mat. Shibutani missile dropkicks Kana, but Kana falls into her corner and tags in Cherry. Cherry hits a jumping lariat on Shibutani and tags in Haruhi, jumping seated sentons by Haruhi and she covers Shibutani for two. DDT by Shibutani and she dropkicks Cherry before tagging in GAMI. GAMI is reluctant to go up top but eventually does so, she walks the ropes while holding Haruhi’s arm but eventually falls and crotches herself. GAMI picks up Haruhi but Haruhi puts her in a hanging submission, but GAMI gets into the ropes. Ohka is tagged in but GAMI catches her with a side Russian leg sweep and GAMI tags in Sora. Ohka boots Sora in the face and then boots GAMI, backdrop suplex by Ohka to GAMI and she covers her for two. Ohka goes up top but Shibutani grabs her, giving GAMI time to recover, Frankensteiner by GAMI and she covers Ohka for two. Atomic drop by Ohka to GAMI but GAMI levels her with a lariat. Fisherman buster by GAMI, but the cover is broken up. GAMI picks up Ohka but Ohka gets away, Sora tries to help but she hits GAMI by accident. Kimura then headbutts GAMI by accident and Ohka boots GAMI in the head for a two count. Tiger Suplex Hold by Ohka, and she gets the three count! Team Kana win! A bit sloppy and disjointed for a match with wrestlers that are in theory familar with each other. Lots of comedy spots although it wasn’t all comedy, as Kimura and Kana had a nice exchange that ended way too quickly. Some miscommunications and nothing that really popped out, maybe everyone was told to keep it mild to not upstage the purpose of the evening. Another not bad but not special match which may be a recurring theme. This match is a NEO Offer Match. It is also more interesting than it appears on paper and is our first singles match of the evening. Genki actually retired the very next night in NEO, so this was one of the last matches of her career. Genki was a 14 year veteran that won titles in JWP and NEO, she never made it to the top of the card but was a respected veteran in NEO at the time of her retirement. Miyazaki had a long and very successful career in NEO, with 11 tag title reigns going into this match. She currently is a Freelancer and wrestles quite a bit in Pro Wrestling WAVE. Miyazaki starts the match with a springboard armdrag but Genki blocks her dropkick, trip by Miyazaki and she catches Genki with a dropkick on the second try. Scoop slam by Miyazaki and the pair trade strikes, Genki throws Miyazaki in the corner and hits a series of chops. Big boot by Genki, and she covers Miyazaki for a two count. Genki goes for a chokeslam but Miyazaki blocks it and hits a chokeslam of her own. Miyazaki goes up top but Genki grabs her and chokeslams Miyazaki to the mat for two. Miyazaki grabs Genki around the waist and hits a German suplex hold, but it gets a two count. Tiger suplex hold by Miyazaki but that gets a two as well, Miyazaki goes up top but Genki avoids the moonsault attempt. Sliding Kick by Miyazaki but Genki levels her with a lariat. Another lariat by Genki, she picks up Miyazaki and she hits an Emerald Frosion. Genki picks up Miyazaki again and nails the G-Driller, picking up the three count cover! Misae Genki wins the match. Too short to get excited about but the action itself was good. Genki was a quality power wrestler, never outstanding but really solid and everything was hit convincingly. The transitions were bad enough to be annoying, no real meaningful selling until the last few moves, but with a five minute match what else can ya do. Not bad but it didn’t leave much of an impression. This is a JWP Offer Match. Unlike some of the previous offer matches, this is pretty much all the top wrestlers of JWP which may be why they got a higher spot on the card. 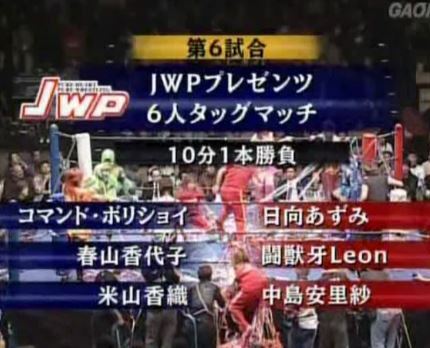 Leon, Nakajima, and Bolshoi are still active in JWP, Yoneyama is a Freelancer that frequently wrestles in Stardom, while Hyuga and Haruyama are retired. 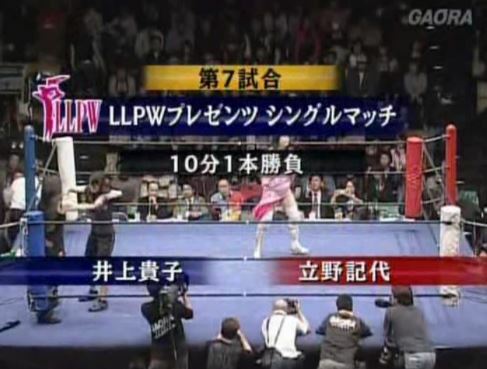 At the time of the match, Haruyama was the JWP Openweight Champion, which is JWP’s top title (she held it a record 719 days) so she is the highest ranking wrestler to be in one of the Offer matches up to this point. Bolshoi and Hyuga start for their teams and trade quick holds on the mat with neither getting a clean advantage. Nakajima and Yoneyama tag in, Hyuga stays in to help but Yoneyama armdrags them both out of the ring. Leon then gets a running start in the ring, jumps up to the top rope and sails out onto everyone with a plancha suicida. Back in the ring, Yoneyama is triple teamed in the corner before Nakajima hits a missile dropkick for a two count. Nakajima tags Leon, spear by Leon and she hits two more for a two count of her own. Leon goes for a suplex but Yoneyama slides away and hits the Chaos Theory. Yoneyama tags in Haruyama, Stunner by Haruyama but Leon catches her with a backbreaker slam. Nakajima and Hyuga run in while Leon goes up top and hits a diving body press for two. Leon tags Hyuga who hits a double underhook unto a backbreaker, she goes up top and knocks down Haruyama with a missile dropkick. Hyuga picks up Haruyama but Haruyama lariats her in the back of the head and tags in Bolshoi. Hurricanrana by Bolshoi to Hyuga, she picks her up and hits a drop toehold into the ropes so that Haruyama and Yoneyama can dropkick her. Tiger Feint Kick by Bolshoi and she goes for a satellite headscissors, but Hyuga blocks it and hits a backbreaker. Running knee to the back of the head by Hyuga and she hits rolling German suplexes for a two count. Yoneyama runs in and kicks Hyuga, La Mistica by Bolshoi to Hyuga but it is quickly broken up. Nakajima comes in but Bolshoi rolls her to the mat and applies a kneelock until Leon breaks it up. Bolshoi tags in Haruyama, kick by Haruyama but Nakajima catches her with a bridging fallaway suplex. Elbows by Nakajima but Haruyama blocks the German suplex. More elbows by Nakajima but Haruyama levels her with a lariat. Haruyama goes up top but Leon grabs her, giving Nakajima time to join Haruyama. Nakajima suplexes Haruyama off the top turnbuckle, Leon then hits a Swanton Bomb and Nakajima finishes with a diving footstomp for a two count cover. German suplex hold by Nakajima to Haruyama, but that gets a two as well. Nakajima goes up top but Yoneyama joins her and suplexes her back off. Haruyama picks up Nakajima and deliver the Keene Hammer but Leon breaks it up. Yoneyama goes up top and is fed Leon’s legs by Haruyama, they together hit an assisted double underhook facebuster on Leon while Yoneyama also sentons Leon. Haruyama goes back up and hits a diving legdrop, but Hyuga breaks up the pin. The bell rings just as she does so, and the time limit has expired. The match is a Draw. This is a LLPW Offer Match. Takako is a veteran from the AJW days and is best down for her tag team with Kyoko Inoue as well as being gorgeous. Noriyo Tateno is best known as one half of the Jumping Bomb Angels, and she had success both in the WWF and AJW as part of the tag team. Her career never really took off after that however, she joined LLPW in 1993 where she soon won the singles title but that was the last singles title she ever held. So two older wrestlers known best for their accomplishments over a decade before, but both still popular and well known by the fanbase. Takako kicks Tateno into the corner right off the bat, kick to the chest by Takako and she hits a DDT. More kicks by Takako but Tateno fights back with elbows, Mexican Surfboard by Tateno and she applies a facelock. Tateno stomps down on Takako’s hands and sends her off the ropes, but Takako snaps off a DDT. STF by Takako, she grabs Tateno by the hair but Tateno gets her back and goes for a suplex. Takako grabs the ropes to break it up, lariat by Tateno and she hits two more, German suplex hold by Tateno but it gets a two count. Tateno goes up top but Takako recovers and joins her, hitting an avalanche armdrag for two. Takako goes up top but Tateno avoids the Takako Panic, lariat by Tateno and she hits a diving body press for two. Tateno picks up Takako but Takako slides away and hits a backfist. Tateno blocks the next one however and drops Takako with a Death Valley Bomb, she picks Takako up but Takako slides away and rolls her up for the three count! Takako Inoue is the winner. Another shorter match and probably the worst one on the show. It was pretty slow with some longer submissions for a match that wasn’t really long enough to sustain it. The match also ended really suddenly, it never felt like it really got going before it was suddenly over. A couple good moves and they worked well together, just not a very exciting match. This is an Oz Academy Offer Match. Even back in 2008, Ozaki was the lead heel of the promotion and Toyota was one of her top henchwomen. And of course one of the best wrestlers in Joshi history. 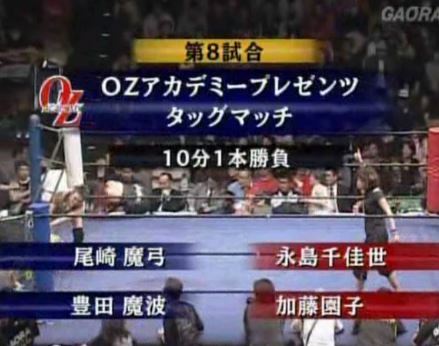 Nagashima joined Oz Academy in 2000 after being one of the top wrestlers in GAEA, with Kato following the same path and they were a regular tag team that would go on to win the Oz Academy Tag Team Championship three times. This has the potential to be the best match on the card, as long as they don’t coast through it. Like any Ozaki match, the action quickly spills out to the floor as Toyota takes Nagashima up into the crowd. Both teams battle up near the entrance way and in the bleachers, they get back near ringside and Toyota dives off the top turnbuckle onto both Nagashima and Kato. They finally get back into the ring, Ozaki gets a chair and she hits Kato, Toyota then goes up top and hits a missile dropkick. Ozaki gets a chain and hits Kato with that as well, but Kato ducks the next attempt and hits a release German suplex. She tags in Nagashima but Nagashima is tripped from the floor, Toyota comes in but Nagashima hits a double springboard armdrag on both of them. Kato slams Ozaki in front of the corner and Nagashima delivers a diving footstomp for a two count cover. Ozaki slaps Nagashima and tags in Toyota, Toyota goes up top and delivers a missile dropkick. She hits another one before putting Nagashima in the ropes so she can be attacked by the entire Ozaki Army. Toyota gets Nagashima on her shoulders but she wiggles away and hits a release German suplex. Diving leg drop by Kato, and she covers Toyota for a two count. Kato goes for the dragon suplex but Toyota blocks it and rolls Kato around the ring. Toyota goes up top but Kato grabs her from behind and hits a release German. Dragon suplex hold by Kato to Toyota, but it only gets a two count. Toyota gets away from Kato as Ozaki throws a chain at Kato, German suplex hold by Toyota but it gets two. Toyota goes up to the top turnbuckle but Kato avoids her moonsault and hits a punt. She tags in Nagashima but Ozaki is also tagged in, sit-down powerbomb by Ozaki but it gets two. Ozaki gets on the second turnbuckle but Nagashima catapults up there and hits a Frankensteiner. Fisherman buster by Nagashima, but Toyota breaks up the cover. Toyota missile dropkicks Nagashima and Ozaki drops her with a dragon suplex hold for two. Ozaki goes for a Shining Wizard, Nagashima blocks it but Ozaki delivers the spinning backfist for a two count. Ozaki picks up Nagashima but Nagashima rolls her up for two. Hurricanrana by Nagashima, but Ozaki rolls through it, fisherman buster by Nagashima but Toyota breaks up the cover. The bell then rings, as time has expired. The match is a Draw. This is Devil Masami’s Retirement Match. Devil Masami debuted in 1978 and over her long storied career she held the top singles titles in AJW, JWP, and GAEA along with many tag championships along the way. For her last match she teams with Dynamite Kansai, with whom she won the JWP Tag Team Championship with back in 1993, and Carlos Amano, who wrestled in Oz Academy but also came up in JWP back when Masami was in the promotion. On the other side were three of the top Freelancers in Joshi, with Ran Yu-Yu and Uematsu being a regular tag team in JWP and GAEA. Masami and Yu-Yu start the match off, they start off politely until Uematsu comes in to help her partner. Masami shrugs off their chops and headbutts both of them, but Kong comes in and lariats Masami to the mat. Kong takes Masami out of the ring and chucks a chair at her, as all six wrestlers brawl at ringside. Kansai and Uematsu end up in the aisle near the balcony while Kong throws the steel plate from the barricade at Amano while somehow Masami made it back into the ring with Yu-Yu and puts her in a sleeper. Masami tags in Kansai, vertical suplex by Kansai to Yu-Yu and she covers her for two. Scorpion Deathlock by Kansai but Yu-Yu crawls to the ropes and she forces the break. Kansai tags in Amano and they hit Yu-Yu with a double shoulderblock, but Yu-Yu pushes back to her corner and tags in Kong. Kong chops Amano against the ropes and hits a lariat in the corner, cover by Kong but it gets two. Amano tries to fight back with headbutts but Kong smacks her to the mat and tags in Uematsu. Uematsu rakes Amano’s face and stomps her down in the corner, Irish whip by Uematsu but Amano hits a jumping lariat and tags in Kansai. Kansai grabs Uematsu and hits a lariat in the corner, but Uematsu dropkicks her in the knee and Yu-Yu runs in too so they can hit a double dropkick. Uematsu stays in but Kansai puts them both in the claw, she slams Yu-Yu to the mat but Uematsu blocks her slam and hits a suplex. Kansai fires back with a suplex of her own, Uematsu tags in Kong but Masami is tagged in as well. Kong kicks Masami in the mouth and hits a back bodydrop, but Masami avoid the elbow drop. Kansai comes in but Kong lariats both of them. Kong tags in Yu-Yu, jumping elbow of sorts by Yu-Yu to Masami and she hits her with a knee. Yu-Yu tries to pick up Masami but Masami blocks it, knee by Yu-Yu but Masami throws her to the mat. Kong runs over and lariats Masami, Uematsu comes in and kicks Masami in the head which swings the advantage back to Yu-Yu, kick out of the corner by Yu-Yu and she covers Masami for two. Amano jumps off the top turnbuckle with a lariat to Yu-Yu, Uematsu comes in but Masami suplexes Uematsu onto Yu-Yu. Amano stays in and kicks Yu-Yu but Yu-Yu returns fire with an elbow and knocks Amano to the mat. 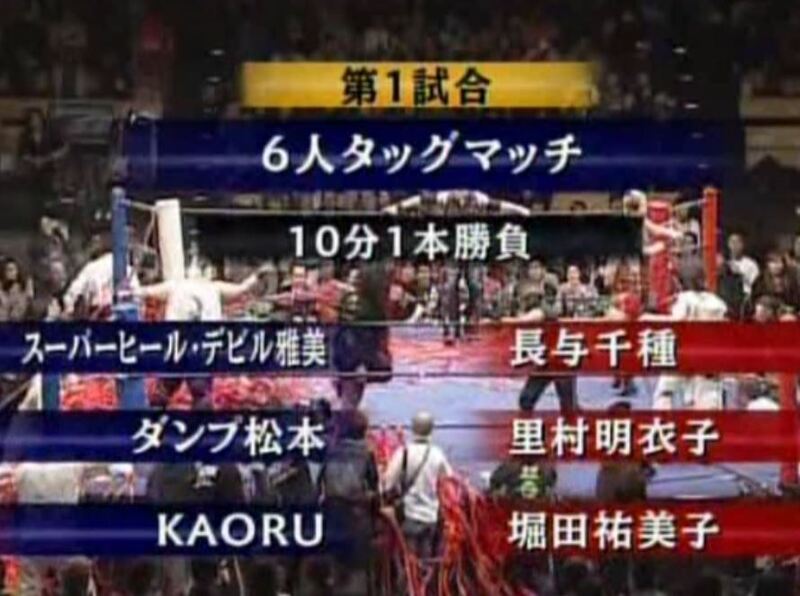 Yu-Yu goes off the ropes but Amano hits a roaring elbow, she picks up Yu-Yu and hits a jumping lariat, but Yu-Yu knees her when she goes off the ropes again. Another knee by Yu-Yu and she hits a release German suplex, picking up a two count. Yu-Yu tags in Kong, Kong punches Amano to the mat but Amano fights back with headbutts. Kong has none of that and hits a hard lariat, she picks up Amano and delivers the brainbuster but the cover is broken up. Kong slams Amano in front of the corner, she goes up top but Masami pushes her back to the mat. Jumping lariat by Amano to Kong and she tags in Kansai. Kansai kicks Kong but Kong catches her with a backdrop suplex, but Kansai kicks out of the cover. Kansai goes up top, Kong goes to join her but Kansai slides out to the apron and kicks Kong in the head. Splash Mountain by Kansai, but Yu-Yu breaks it up. Kansai goes up top but Kong avoids the footstomp and Uematsu comes off the top with a missile dropkick. Shining Wizard by Kong to Kansai, but the cover gets two. Kong goes up top but Kansai avoids the elbow drop, Kansai goes up again and this time she hits the diving footstomp, but Uematsu breaks up the cover. Masami is tagged in, she picks up Kong as Amano goes for a missile dropkick, but she hits Masami on accident. Kong tags in Uematsu, dragon suplex hold by Uematsu but Masami gets a shoulder up. Hard elbow by Yu-Yu to Masami but Masami fires up and lariats all three of her opponents. Masami picks up Uematsu but Uematsu slides away and Kong lariats Masami. Uematsu gets on Yu-Yu’s shoulders and hits a diving body press on Masami, but the cover gets two. Uematsu goes up top but Masami hits her before she can jump off, Yu-Yu runs in and grabs Masami however and Uematsu hits a missile dropkick. Masami pops up and lariats both of them, Kansai comes in and starts kicking people as Masami picks up Uematsu and hits a Liger Bomb for a two count. Yu-Yu has recovered but Masami scoops her up and nails the Fire Valley. She then hits it on Uematsu, but Yu-Yu breaks it up. Kong picks up Masami and hits her with a backfist, Uematsu gets behind Masami and nails a dragon suplex hold for the three count! Kong, Yu-Yu, and Uematsu are your winners! After the match, Devil Masami had a Retirement Ceremony that lasted 45 minutes. It included wrestlers saying farewell with flowers, testimonials, and of course the streamers at the end. Masami couldn’t have looked happier, and it was a fitting end to a long and storied career. Well that was one hell of a review. I found a write-up of the event online that said the matches were all short before the main event because the show was shown live and they had to make sure they had plenty of time for the Retirement Ceremony, which sounds like a plausible explanation. There was still a lot to enjoy here, seeing the older veterans cut it up (literally and figuratively) in the opener was fun and the Masami Retirement Match was entertaining just to see how much fun Masami was having and seeing everyone putting in every ounce they had to make the match worthy of her final match. The Offer matches were hit and miss, some were very skippable while others had some solid action, but all of them were really just filler between the opening and closing of the show with Masami. A memorable show for the retirement of a true legend of Joshi, but if you watch the show just remember all the Offer matches were short and most weren’t noteworthy.